This was a really enjoyable and interesting book. I got to learn more about the conditions of life in concentration camps. The reader makes you empathise with the main character deeply. My favourite part of the book is when Ella is in the dressing room for the first time and is watching Carla in the green dress that Ella made. Also when Ella and Rose are dancing around in the dressing room. I would have liked to see more drama or more plot twists earlier on. I would give it 4.5 stars in recommendation. For those of you who don't already know,˜The Red Ribbon' is a book written by Lucy Adlington. The story is set in Birchwood, a concentration camp based in Auschwitz-Birkenau, during World War Two. This book is written from the perspective of Ella, a fourteen-year-old aspiring dressmaker, and we follow her thoughts and feelings along the emotional rollercoaster that was living in a concentration camp. The book informs us all about life in concentration camps and what starts as just a story, suddenly becomes a time machine into the world of World War Two, in which many Jews were imprisoned for simply having different beliefs. This book gives us a thorough insight into the horrifying world that was once a reality for some and leaves you wondering how anyone ever survived. Lucy Adlington uses a wonderful description of setting and emotion that really makes you feel as though you are in Birchwood with Ella. I enjoyed reading about Ella's thoughts and how every person she meets is compared to an animal in her ˜human zoo'. Adlington also uses beautiful characterization to form unique personalities that blossom into special friendships and interesting rivalries. There is also a fabulous character development throughout the story that makes us never want to put it down. I find the history to feel heartbreakingly true. I think that it gives us a real sense of what went on during the second world war, although we can never really know what happened to those who suffered. We are given a real sense of the feeling of hope and just how powerful that can be. We realise that for those who have nothing, hope can be everything and that all they dream of is to get out of the awful places that were concentration camps. I find that it is well-researched and informative, which is woven into the natural context so seamlessly that we don't really realise just how much we learn from it. One of the books main themes is survival. Ella often questions just how far she will go to survive in Birchwood. The dramatic ending and pivotal events throughout make it so that it is impossible to put down and leaves you wanting to read more. I found that it isn't like typical stories set in World War Two as it has a different meaning behind it. It doesn't focus on the same things as other books set in the same time period, but instead on the relationships and work life of those trapped in these terrible places and that makes it so much more interesting to read. I thoroughly enjoyed this book and I would highly recommend it to anyone who considers reading it. The storyline is gripping and moving and the beautifully illustrated pages tie the whole book together in a wonderfully subtle way, reminding us just how important this red ribbon and dreams of sewing were to Ella, a theme that carries through the entire book just like the red ribbon flows through the pages. I enjoyed the book and how you got to hear something from someone's perspective, e.g. Ella. However I did find it a bit repetitive in some places. For example, just describing the workhouse over again. Saying that, though, I did like it and find it interesting when she was describing the conditions, because I found it interesting how it was so different in there compared to outside. I particularly liked the character Rose because she ended up in a place like this even when she was rich. I enjoyed hearing when she was telling her stories. I definitely think the history is realistic because it is based on the Auschwitz-Birkenhall, also because of the way it is told. I started reading this book about sewing dresses but I didn't finish it because I couldn't really understand what was going on. I think Ella is Jewish and it is set during or just after the Second World War. I am sorry the book did not capture my attention enough so I stopped reading it. It seemed more about making dresses than history. Red ribbon is about the life of a girl who was sent to Auschwitz Birkenau during WWII, she was taken from her grandparents and taken there. Because she was a Jew. It follows her story as she tries to attain a job there, as a dressmaker. It is a heart-warming story following her struggles. This book includes many emotions and distress not much unalike from real Auschwitz Birkenau. The story ends in happiness and the end of the war. It is a must read for all. I'd recommend it for older teens, since it contains topics young teens/ children may not understand. Overall it is a great book with a well-structured story that truly connects with the reader. The Red Ribbon was a really good book to read and it was about the Holocaust but in a fictional way.Ella, a sixteen year old begins her first day of work as she steps into a world of silks, seams, scissors, pins, hems and trimming. She is a dressmaker, but this is no ordinary sewing place. Here there are no ordinary clients. It is much, much worse. This place is called Birchwood. Every dress Ella makes can mean the difference between life and death. This place is all about survival. One thing weaves through the colours of gowns and camp mud- a Red Ribbon given to Ella by her best friend Rose who stole it. She has been forced to come work at Birchwood and after a while of sewing and stitching ordinary people come to save them and other people. The people that worked there had to run to the city of light so they wouldn't survive and guards were with them incase they tried to escape and if they did they would be shot and one of the survivors was Rose. Did Ella survive or not? Many people died of starvation, tiredness and sickness. I really want to search more about the Holocaust because before I didn't know what it actually was and now that I have read the book I want to see what it is about and how it happened. It has also inspired me to do more history research on different things as well. The history inside this book was exciting and fascinating. I want to read more books by the author, Lucy Adlington because I think this book is really interesting and I want to see if her other books are better than this book or worst. This book is one of the best I have read so far and I give it four and a half stars because there is absolutely nothing wrong with the book apart from when it comes towards the middle it stays on the same part for a bit too long but I still liked the detail of the story when it was on that part. It was still very entertaining. At first I didn't enjoy this book and it felt like a chore to read. The story takes a while to develop and follow an interesting story line. At the beginning the story side tracks into unimportant details. It was also confusing as there were no clues about the time period it was only 50 pages in that we got to find out for sure what the time period was. Most of the sentences and language was very simple, detailed was added where not needed but was lacking when needed. A lot of the time I sympathised and even empathised with the characters; most of the story is historically accurate the author even proves this by adding context during the afterword. Overall I enjoyed this book and I would recommend it. The book was really interesting because it was all about these girls called Ella, Rose, Mariam and Clara that refer to Second World War. The most interesting part would have been when Ella survives the camp that she was in. It says that she was good at sewing but, she was hated by Clara because she wanted to be pretty. She was asked to go away from the department because she hurt her hand, so they had to make her go away from there. They only needed the people that they could still sow for the guards in the concentration camp which, people had suffer. Ella and Rose had to get another job to survive. The camp was horrible; they had to wash things which then could help the people for whom they did work. Rose got sick and they had to bring her to hospital which was bad. Then Ella saw the chimneys bellowing with fumes. There was gas things called gas chambers where you would have put five people and dropped a drug that made people die quickly. She thought that she had lost her dear friend but, then things got harder. Maria the leader of the sewing people was kind enough to give her a string and pins to make a liberation dress, she made it out of the camp but the evil Clara shot her and everything went down after that. When Ella is sent to Birchwood concentration camp for being on the 'list' she frantically tries to find a way to survive in the wide sea of women in striped dresses. One day, an advertisement comes up for a worker in the camp tailors. Ella is determined to get that job and be the best, no matter what. A dress could make the difference between life and death. Whilst she is on trial working there, she meets a girl, about her age, named Rose. Rose claims to be a duchess, against the government and has some crazy stories. Will Ella and Rose be able to escape the horrible camp of Birchwood or would they be sent up the 'chimney'? Ella - A determined 14 year old with dreams of leaving Birchwood and opening a dress shop. Rose - A well spoken girl with a privileged upbringing, who claims to be a duchess. She is always telling enchanting stories. Marta - An ill-temper manager of the tailors who is always shouting at everyone. Not many know her past and what she gave up for her sister. Carla - A girly, bubbly prison guard who can turn on you like lightning. She loves wearing dresses, created by Ella, but hates 'stripeys' and does whatever she can to get rid of them. I think that this book is a more whimsical version of what it was really like in the concentration camps, however, there were parts that perhaps were true to life. I really found this book eye opening in parts, for example where the guards abused the prisoners horribly and how people reacted around them. This seemed quite realistic to how it probably was. I enjoyed this book because I loved how the author incorporated the tailors into the story to give it less of an overall sad-feeling vibe. I also really liked the character Rose because she always had her head in the clouds and sometimes didn't realise what was really going on. I would definitely recommend this book to others who are interested in historic stories and those interested in needlework because the story has an overflow of adjectives to describe the methods that Ella uses in her work. The Red Ribbon by Lucy Adlington is historical fiction about the Holocaust. Birchwood is a concentration camp in Poland where anybody on the 'list' gets brought there. People get on the 'list' by: being a Jew, homosexual, a Jehovah's Witness, having a disability (mental or physical), being an enemy of the Nazi ideology and others. The main protagonist of the story is a girl who's called Ella. Ella is a Jew who was captured off the streets and thrown into Birchwood. She starts off the story by working in a sewing room where they're forced to make clothing for the high ranked people in Birchwood. Ella must learn how to survive and also find friends along the way. I found this book unputdownable from the beginning with its intricate detail, intriguing story line and beautiful art work (a bonus to reading the book). It puts you through lots of different emotional responses to the different events in the book. For example, annoyance when Ella is about to leave her friend Rose, sympathy towards the way the people there have to live their lives and sorrow when you find out Ella was just taken off the streets without anyone knowing where she is. I loved reading this book and would recommend it to anyone to loves reading. The writing in The Red Ribbon doesn't tell us much about the war and what's happening throughout the concentration camp apart from what Ella does. However, their is an afterword in the book where Lucy Adlington tells the reader about what in the book is historically accurate and what is not. The story line and characters in the book are made up however, there was a concentration camp named Birchwood in Poland. It was called Auschwitz-Birkenau. There was a sewing room in Birchwood, like the one Ella worked in and the 'department store' (the land of plenty) in The Red Ribbon also existed. In conclusion, the story's history is very accurate. I would give this book 5 stars because of its amazing storyline, intriguing history and beautiful art work. It has opened my eyes to how brutal the concentration camps were and how malnourished the victims of it became. 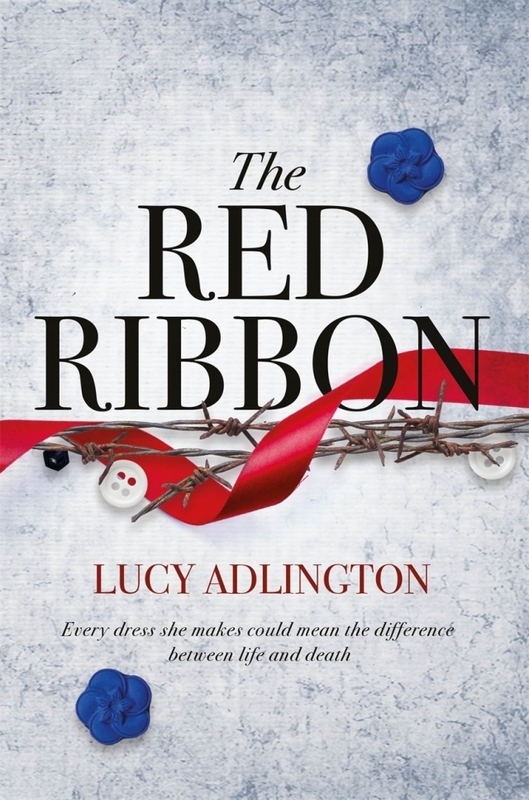 The Red Ribbon has made me want to find out about the Holocaust and read more books by Lucy Adlington. The book I am reviewing is The Red Ribbon. This book is set in ww2 in Auschwitz concentration camp. The main character is a girl called Ella. She dreamed of owning a sewing shop when she grew up but She was sent to the concentration camps because she was Jewish. When she arrives she is lucky because she is able to get a job at the 'upper tailoring studio'. As she had experience sewing and dressmaking before she was sent there, she is hired over the 2 other candidates. There she makes friends with a girl called Rose, who tells her amazing stories about her life, but Ella doesn't believe her. After Ella is fired for having a broken hand she has to work in the washing area. Around this time Rose falls ill. Ella decides to send her to the hospital in a chance she could be saved. The hospital is then emptied and Ella is distraught. She makes a liberation dress from material she took from the 'department store' but the first one is stolen. Her old friends from the upper tailoring studio send her a package with pink material, pins and buttons. She spends all of her nights sewing the dress in hope it will be finished in time. When the liberators get too close, they are taken and forced to run by the guards. Ella meets her old boss from the tailoring studio but she has grown weak and ill. She tries to carry her on but it is too much and they fall over. The guard comes and shoots them both. A turnip farmer discovers the two at the end of her field. She managed to just save Ella and looked after her until she recovered. She left and went to paris, where rose had told her stories of how beautiful and amazing it was. When she arrives she actually meets Rose again. Rose had not died but had been transferred to other concentration camps and the one she was at last was freed. The ending is happy as they achieve their dreams of owning a little sewing shop in Paris. I think that the historical information included in this book was quite accurate. The Nazis did send jewish people to concentration camps and left them to die. The upper tailoring studio was a real think where the prisoners made fancy outfits and dresses for the guards and the general's wife. The characters in the book were inspired by real people and some even were real people such as marta who was the boss of the tailoring studio even though she was a prisoner she was a higher ranking one and the officer's wife. The book showed the awful living conditions of the camps very well stating things like how they had very little to eat, they had clothes that were practically striped sacks with a star sewn onto them, how they had to work all day to stay alive and not be sent to be killed and how overcrowded it was so that it was sometimes 5-6 to a bed. It also shows a new side to what happened in Auschwtiz, because the sewing and tailoring parts are usually not mentioned in other books and films. This book is set during ww2 but uses modern day language. The values the characters have are time appropriate though asÂ the guard characters hate the Jewish people and call them 'stripeys' and see them as less value or human as them. The language used in spoken dialogue is quite modern but as this is in quite recent history it wouldn't have changed that much. I think that the main character, Ella, was a good and relatable character. When put in situations she did what most people would do. She was a strong character who put her friend and herself first so that they could make it through this together. She was clever with her recourses such as when she sewed a pocket onto the inside of her dress to keep things in. She knew what the best thing to do was for her and roses survival. When she got ahold of cigarettes (which were used as a currency) she spent them wisely so that she could maximise her and roses chances of survival. She knew that the best thing was for them to work as hard as they could so they would not be fired. Overall I think that she was a likeable and well written character. tailor shop and they lived happily. I think that this ending is very poor because it makes everything into a happy ending. This would not have happened in reality though. I think that an ending where their dreams donâ€™t come true would be more realistic and suit the rest of the book better. Overall I thought that The Red Ribbon was a good book that I would recommend to most people, especially teen girls but I think that the ending seemed very unrealistic and a poor end to what would have been an amazing book.